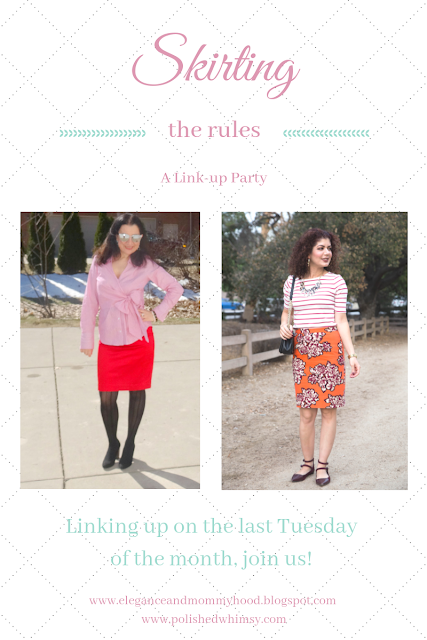 "Skirting the Rules" Linkup: Peppermint Candy Stripes for Christmas. I don't know how it is the "Skirting the Rules" time again, which means it is the last Tuesday of the month and this is the 11th month of the year, so there is only ONE MONTH left to the year, but the best and most festive month of the year - December. A chilly month, even with white fluffy stuff on the ground, as you can see from my photos, but it is the warmest, coziest month on the inside as we all get festive, put on lights and candles, decorate, etc. Continuing with that festive vibe, my lovely co-host ELSIE from Polished Whimsy and I both are wearing red today and even have Candy Peppermint Stripes on top. It is almost Christmas after all. This outfit is "perfectly themed" this month because I am wearing red and black which are Albania's colors. And November 28th is Albania's Independence Day while the 29th of this month is Veterans' Day. In my opinion though, you can never go wrong with red and black. They are the sexiest colors after all and the most feminine ones, I believe! RED+BLACK, PEPPERMINT CANDY STRIPES FOR CHRISTMAS. 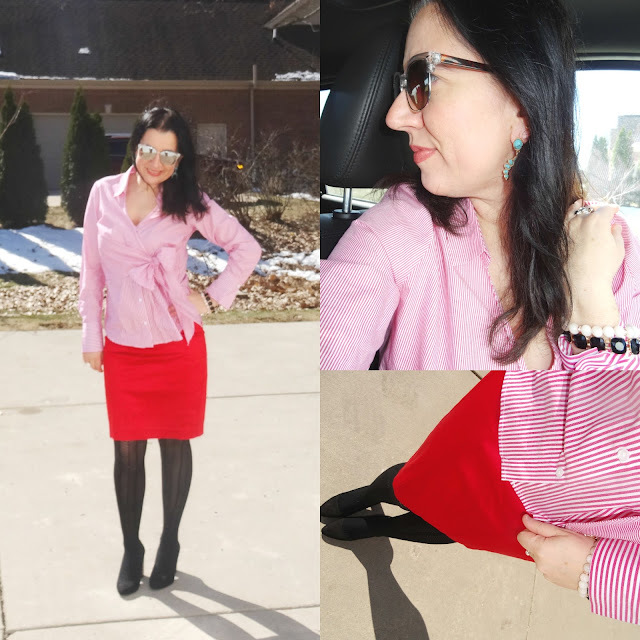 This was a work+dinner date outfit (2-in-1, I tell you) featuring this old Red Satin Pencil Skirt I have owned for years (from Arden B) and this Gorgeous Peppermint-Striped Red Button-Down Blouse by Who What Wear from Target. I love the layered bolero part of the top which ties into a pretty statement bow. 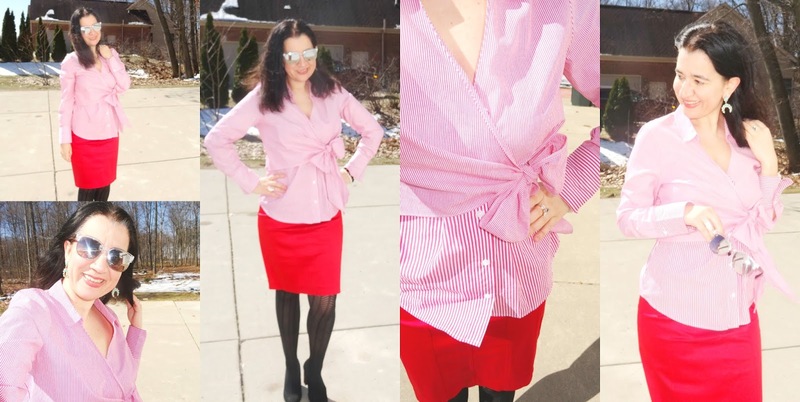 Also the top part is a wrap style which ties into a bow while underneath it, it's a classic straight button-down. Makes this top beautifully asymmetric yet still classic and elegant for work. I love bows in general but even more so around the holidays. I find them fun and festive. My gorgeous top is almost a year old but I found several beautiful ones with red+white stripes that have interesting bows, ruching and 3D effects. I linked them on a widget, below. I decided to anchor all the red with black, so I wore my Chevron Black Tights by Loft and made my legs look extra long with Faux Suede Black Pumps. My Turquoise Horse Shoe Statement Earrings are by Sugarfix from BaubleBar. I love the unexpected pop of turquoise in this outfit. People usually associate Turquoise Jewelry with Spring and Summer. While that is usually the case, don't refrain to wear it in the Winter. I also added a couple of sparkly bracelets. It is spectacular. My lipstick was a peachy one with a little bit of shimmer. Loved my makeup in general but you can't beat a good hair day. Even with all the wind playing with my hair, my hair still looked good! Meanwhile, in SoCal where Elsie lives is much warmer so she can still wear short sleeves, bare legs and florals without looking out of space. Love that bright orange pencil skirt and the bubble sleeves of her top. While I went with statement earrings, she chose a statement necklace. Great look! Coincidentally, Elsie wore a floral skirt with a striped top last month, too. My Dear and Beautiful Friend Lorena is my (absolute) favorite look/outfit that was linked last month. Looking like a million bucks Lorena was dressed to impress as if she was at an 'Awards Ceremony in Cannes'. 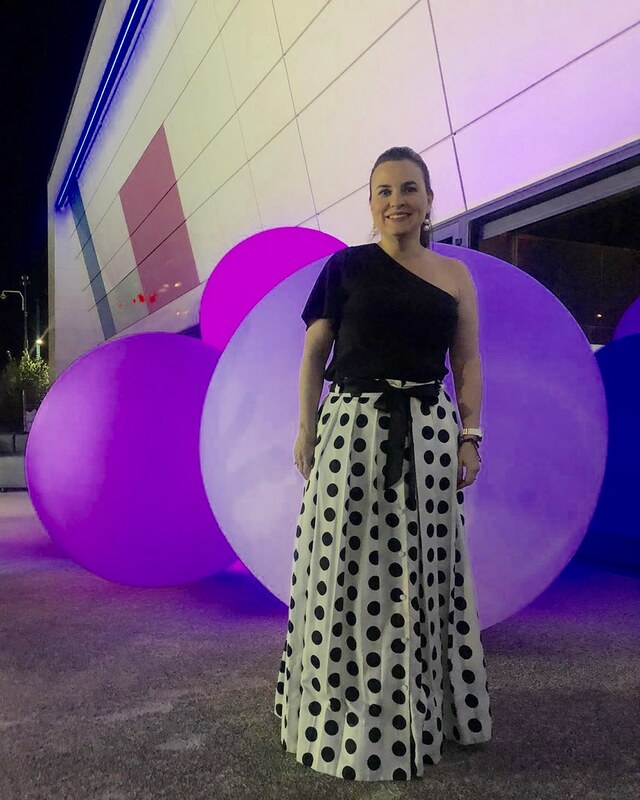 Dressed in this two-piece gown made of a one-shoulder top and the most beautiful large polka dot maxi skirt which I absolutely love, I would also feel as if I belonged in a famous red carpet walked by Hollywood stars. Very well done Lorena. You haven't looked better! Now Join our 3rd, NEW and SUPER FUN "Skirting the Rules" Linkup. Isn't the graphic so fun and fabulous!? I love it!! You can link up any outfits here, not just skirts, but Elsie and I will pick a couple of favorite skirt looks to feature each month! The linkup will be open for an entire month, for your convenience. Have Fun, blog-hop around and meet some other fabulous fashionistas along the way!